The last Jubilee celebrated by a monarch other than Her Majesty was that of her grandfather, George V. This is fitting. She has always followed in her grandpa’s footsteps. She perched on a little chair between the King and me, and the King gave her biscuits to eat and to feed his little dog with, the King chortling with little jokes with her–she just struggling with a few words, ‘Grandpa’ and ‘Granny’ and to everyone’s amusement had just achieved addressing the very grand-looking Countess of Airlie as ‘Airlie.’ After a game of bricks on the floor with the young equerry Lord Claud Hamilton, she was fetched by her nurse, and made a perfectly sweet little curtsey to the King and Queen and then to the company as she departed. 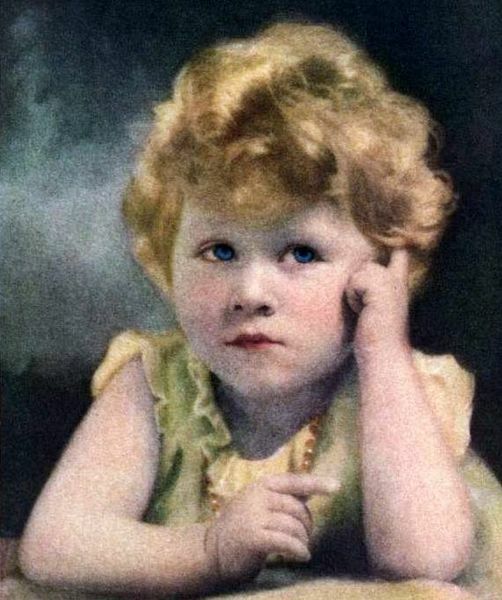 There is no one here at all except the family, the household and Princess Elizabeth–aged 2. The latter is a character. She has an air of authority and reflectiveness astonishing in an infant. Those were the thirties. Grim years of Depression and a war looming over a country exhausted and heartbroken after the last. George V had not been popular in the first years of his reign because he lacked the flash and warmth of his father, Edward VII. During the Great War he kept to a behind-the-scenes role, conscious of other monarchies falling all around him. He was also mindful of Britain’s rising republicanism and felt he must persuade his government to deny asylum to his own cousin, the Tsar of Russia. He never aimed to be popular. When the wind blew the other way, he kept to his convictions that would never sacrificed for “good press.” He even rebuffed his son, the man who could not rule without the woman he loved, for prosing on about giving great press. He was a Sailor King like William IV, another monarch doomed to follow a predecessor (George IV) given to indulge in self-acclaimed brilliance. He was frugal, modernizing his father’s Britannia for a second racing career even as the yachtsmen of England urged the king to have the 1892 boat replaced. He refused and kept the vessel throughout his reign. On the sixth of May in 1935, George V celebrated his Silver Jubilee, astonished at how many people were lining the streets. But none of this went to his head, as he indicated upon leaving St. Paul’s after the service of Thanksgiving. Duty renews us all, year after year. It binds us to the past so that we can live in the future. I suppose that is why the Lebowitz portrait of Her Majesty is so apposite of the Reign, funereal in its depiction of an order that is everlasting. When George V died, Britannia was towed into deep water south of the Isle of Wight and sunk. This entry was posted in Uncategorized and tagged Britannia, Diamond Jubilee, Elizabeth II, George V, Lilibet, Queen Mary by Angelyn. Bookmark the permalink. Love all things British royal. Thanks for the historical reminder of what happened in the past. I remember watching the coronation of Queen Elizabeth on early black and white tv. It was quite thrilling. Oops, I’m telling my age! A very early video of Queen Victoria’s Diamond Jubilee procession is on the website above–I know you don’t go back that far, but how wonderful to see the jubilation of the people as Her Majesty’s coach goes by. Thanks for another informative post. I always enjoy hearing about monarchs who were actually faithful to their wife (or husband). Must be the romance writer in me. The post really didn’t convey the strong instinctive feeling I have about Her Majesty’s reaction to the Princess of Wales’ death. 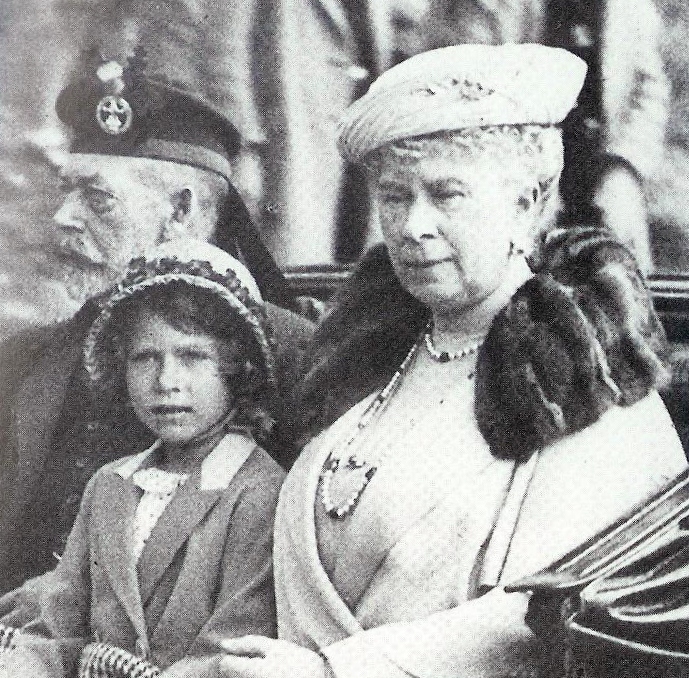 HM was raised by icons–Queen Mary, George V and her own parents the Queen Mother an George VI. Duty was paramount in a world turned upside down by bombs and nameless acts committed in a people’s name. How dismaying it must have been to be wrenched from that world to confront a sea of people crying over the death of one person. How does one comfort where millions still cry out from graves across Europe? Oh, dear! Where did all that come from? Her Majesty and her grandmama would surely disapprove of such sentimental rubbish. Very nice post. I loved reading about Elizabeth when she was two. A darling she must have been, if I may be so impertinent to say so. Thank you, Angelyn, for such an interesting blog. I may be two weeks late checking it out, but it was something I really wanted to read — a reward for making my deadline! I’m glad you like the blog, Cheryl. It’s fun to roam the corridors of history with such knowledgeable companions like yourself.